Following the introduction in 2013 of the FFICM exam for trainees in intensive care, this book provides candidates with practice materials for the MCQ section. 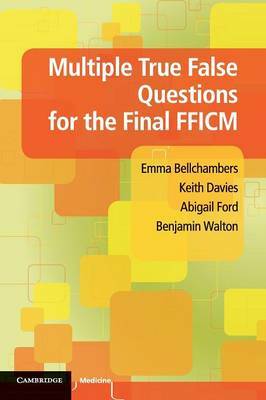 Written by a team of specialists in intensive care medicine, including senior trainees who have recently passed the new exam and authors of the popular FRCAQ website, the book contains 270 multiple true-false questions that cover the breadth of the current Faculty of Intensive Care Medicine curriculum. These are presented as three 90-question practice papers, providing candidates with a faithful simulation of the style, standard and format of the questions they will encounter. With short and long explanations for each question, presented with up-to-date references for extended reading, this book is both an ideal tool for in-depth exam preparation, and an excellent resource for practising consultants in intensive care medicine. It is also suitable for candidates taking the EDIC and other intensive care exams worldwide.